Ljubljana is Slovenia’s capital and home to about 270,000 people. It’s big enough to have all the amenities of a big city with small town charm. We loved our time in Ljubljana and would definitely go back. Since we stayed for a month, we couldn’t go full-on-tourist everyday because it would break our limited budget. 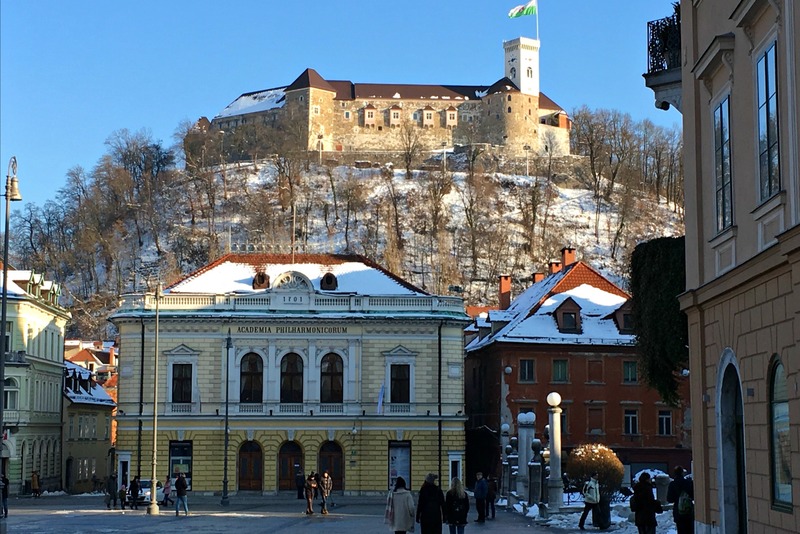 Fortunately there are a lot of free and almost free things to do in Ljubljana Slovenia in winter. Winter is Ljubljana is a special time. There are so many ways to make the city cozy and festive. And the huge bonus is that there are so many free things to do in Ljubljana. But don’t despair, this Ljubljana what to do list (for free!) works in summer, too. The first thing you want to do when you get into Ljubljana is walk down to the river and check the place out. Anywhere in the old town is a good place for people watching, especially on the weekends. If you are willing to spend a few Euros, grab a seat at one of the river side cafés for a cup of coffee or tea. There are heaters under the tables and blankets on the back of most seats to keep you cozy while people watching during the Ljubljana winter. Ljubljana Slovenia winter doesn’t mean staying inside. The Ljubljana Castle towers over the city and can be seen from most places in the old town. Climb the castle hill and wander the trails. You’ll find a physical fitness course, a vineyard, and great views. Check out the castle courtyard and walk the ramparts for free. If you want to visit the museum or other parts of the castle, you will need a ticket. Don’t miss the swing out front. This is one of our favorite things to do in winter. Play, play, play! Want to see our Ljubljana accommodations? Click here to see “JoJo Apartment Ljubljana.” For other places to stay in Ljubljana, check out TripAdvisor for the best deals. 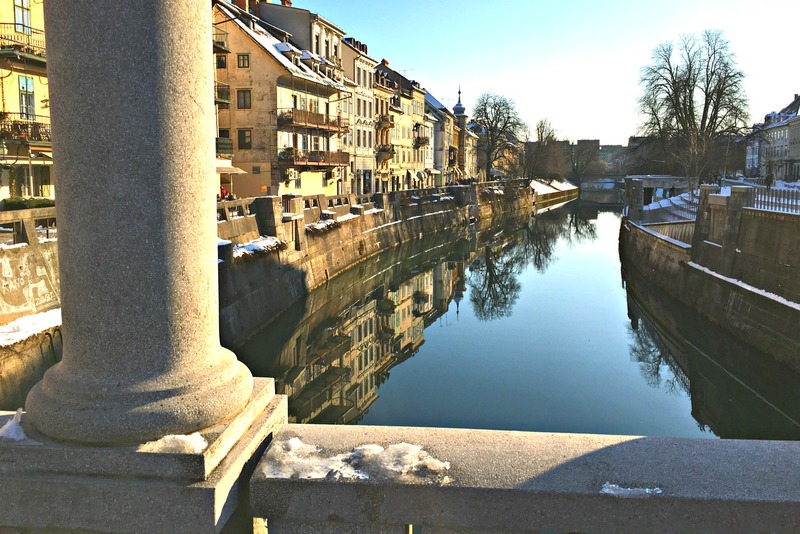 Free walking tours run all through the Ljubljana winter. 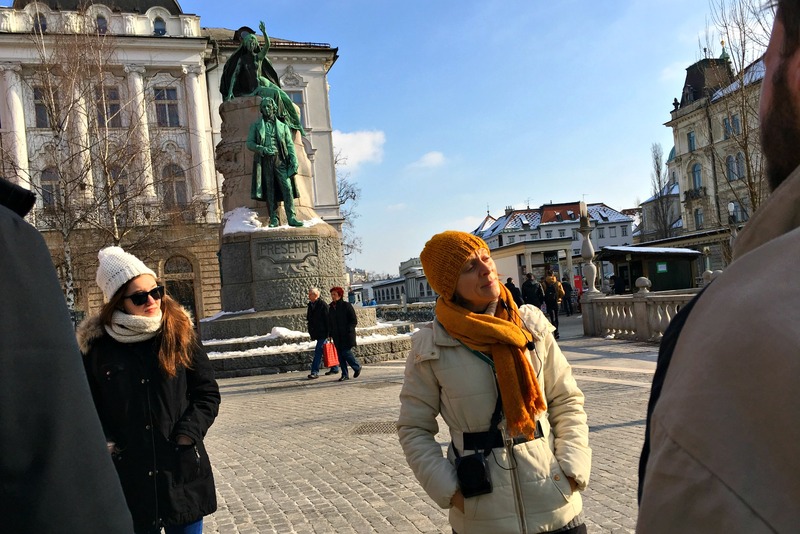 Ljubljana Free Tours offers free walking tours of the city daily, even in winter. Anders and I took a free walking tour of Ljubljana and loved it. We learned so much and looked at the city a little differently after that. While it is free, it’s good manners to tip the guide. They don’t get paid for their services and that’s how they can offer a free walking tour Ljubljana. I love that they do these even in winter in Ljubljana. If group tours aren’t your thing, you can download a range of self guided walking tours of Ljubljana from GPSMYCITY. I didn’t try any of these (I like to ask questions! ), so let me know if you use them and what you think. There are more Ljubljana alternative tours here. One of three parks within the city of Ljubljana, Tivoli Park is the largest at five square kilometers. The park area blends into the slopes of the Rožnik hill, which is full of trails. We entered the park through Jakopič Promenade, a free, open air photography exhibit. Anders and I spent several hours wandering around. I used Google Maps on my phone to keep track of where we were, but mostly we just chose whichever path looked most interesting. We got to the highest point, played on a huge, rustic, physical fitness course, and stumbled on a giant ski jump. The Ljubljana Central Market is a great place to get fruit, veggies, nuts, and meats, but it’s also important culturally. The building was designed by beloved Slovenian architect, Jože Plečnik and stretches between the Triple Bridge and the Dragon Bridge. Adjacent Vodnik Square hosts vendors Mon-Sat, but the most popular day (and some say the most fun) is Saturday. Slovenes congregate for shopping, socializing, and taking advantage of all the yummy prepared foods. Don’t miss the flower market at the junction of Pogačar Square and Vodnik Square. St. Nicholas Church is on the edge of the Central Market. 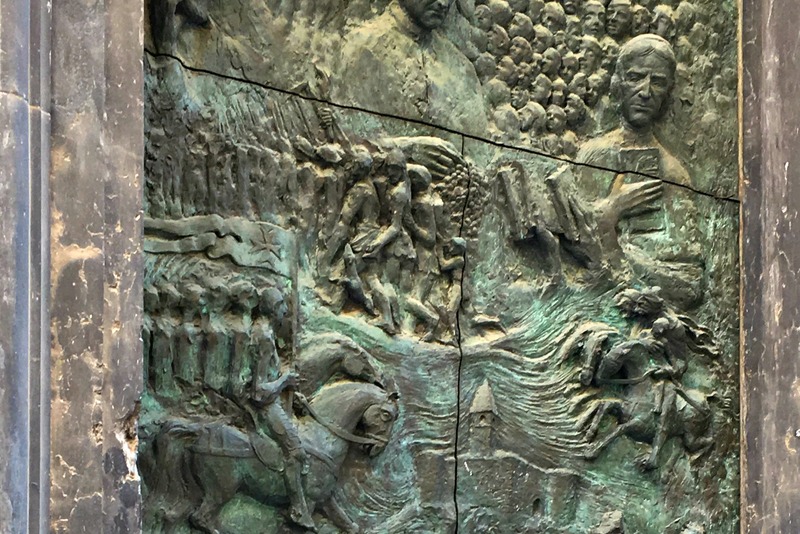 If you take the Free Tour Ljubljana you will learn about the unusual doors and go inside. If the tour isn’t on your list, you can read up about it here. Unless there is sign outside indicating it is prayer time, you are free to go inside. It is quite beautiful. Ljubljana cathedral opening hours: Closed from 12:00 – 15:00 and services are held daily. Ljubljana is known for its dragons. From the four that guard the Dragon Bridge, to the top of manhole covers, to scary dragons on the side of buildings and cute cartoon dragons on souvenirs, to dragons wrapped around the label of the local beer, you’ll find dragons everywhere. The story goes that Jason (remember him from Greek mythology?) passed through Ljubljana on his way home with the Golden Fleece, and that he and his Argonauts killed a dragon. That’s why dragons are considered protectors of the city. I don’t totally get this. Since they slayed the dragon, how is it a protector? This bridge is also nicknamed the “mother-in-law’s bridge.” They say the dragons will fly away once a virgin crosses the bridge (hilararious). If you have traveled around Europe at all, you will know this is a big deal. It generally costs money to use the public bathrooms. It’s not expensive, but when there are four of you, and two of you are kids who need to go when they need to go…it adds up. But in Slovenia you pee for free. The public restrooms around the city center are not only free, but clean and warm. Public toilets at the Ljubljana Railway Station and within the city centre are free. 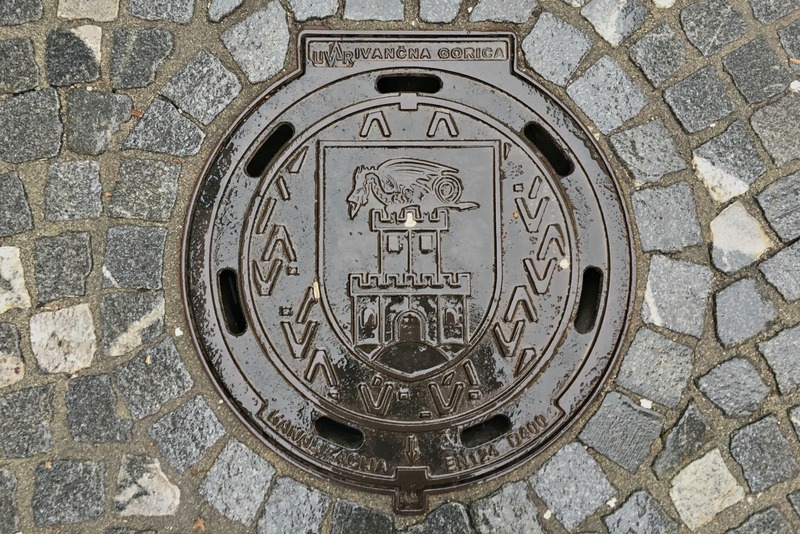 You can find public toilets below most of Ljubljana’s bridges and in a number of other locations. Most of the toilets have disabled access. Details on locations and open hours here. You have to time it right, but the national museums are free on the first Sunday of the month. They are also free on certain holidays. 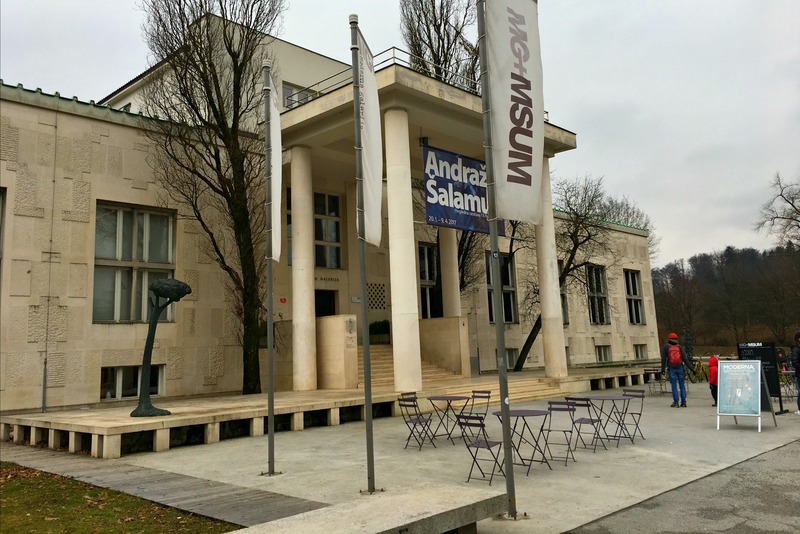 We toured the Moderna galerija Ljubljana / Museum of Modern Art Ljubljana, the Slovenian Museum of Natural History, and the Ljubljana City Museum on February 8th – the anniversary of the death of the great Slovenian poet France Prešeren. A lot of people take advantage of the free days, so be ready for crowds. The City Museum Ljubljana was really cool. Other free days include: International Museum Day (18 May), Museum Summer Night (the second or third Saturday in June), This Merry Day of Culture (3 December, the birthday Slovenian poet France Prešeren). Museums stay open until midnight or even later and quite a few educational events take place. Check out these free museums Ljubljana. I wrote about this in my Fun for Kids in Ljubljana post, so I will go ahead and quote myself. Near the train station, abandoned army barracks has become a gathering spot for artists, underground musicians, and Slovenia’s subcultures. 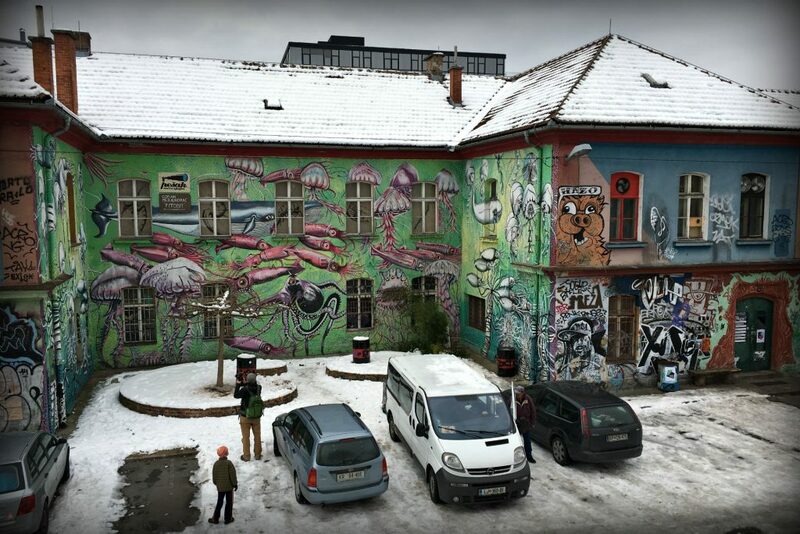 Metelkova Mesto is a 12,500 square meter autonomous region just blocks from the capital’s charming, historic, old town. Most nights, hundreds of people gather within the graffiti-strewn walls, amidst tile mosaics and creepy sculptures, to attend one of 1,500 alternative events in its illegally (but condoned) occupied buildings. During the day it’s pretty much empty. You can stroll past the artwork, climb a big jungle gym/tree house, and appreciate the other side of Slovenian sensibilities. It seems a little drab and creepy for visiting Ljubljana in winter, but I think that’s part of the point. There are art shows, concerts, etc that happen here if you are looking for things to do in Ljubljana at night, but we were told it wasn’t very kid friendly. 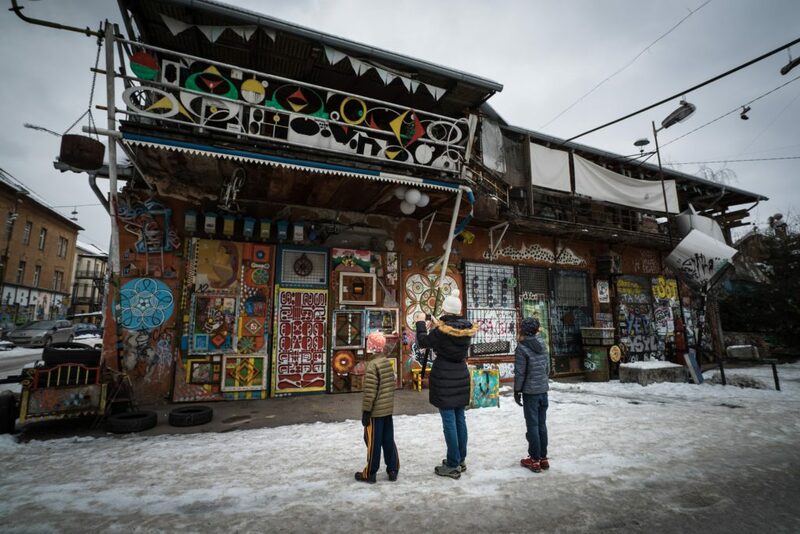 You can also sign up for a free 2-hour guided graffiti art walk, which ends at the Autonomous Cultural Zone Metelkova City. Unfortunately, we did not do much hiking near Ljubljana. As I mentioned above, Tivoli Park and Castle Hill are nice for in-town trails. Two others I would have liked to visit are Šmarna Gora and St. Katarina. Šmarna Gora is the highest hill in Ljubljana at over 600 meters. You can get there via car or bus (take line 8 toward Gameljne to the Tacen station). St. Katarina is purported to have amazing views of snowy mountains. Drive or take bus 51 from Bavarski Dvor to Žirovnik station. I wish we had fit this into our time in Ljubljana. 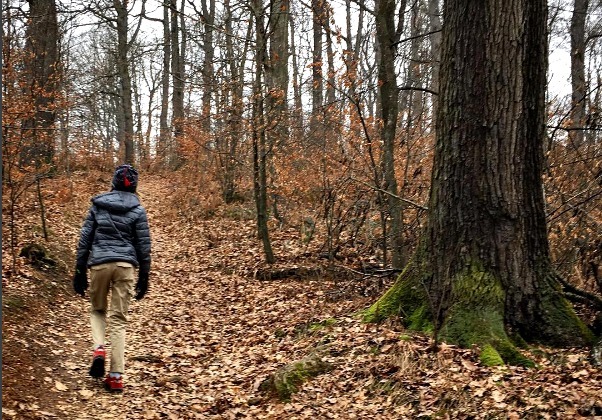 Read Hiking in Ljubljana: The 5 Best Short Hikes for more details. 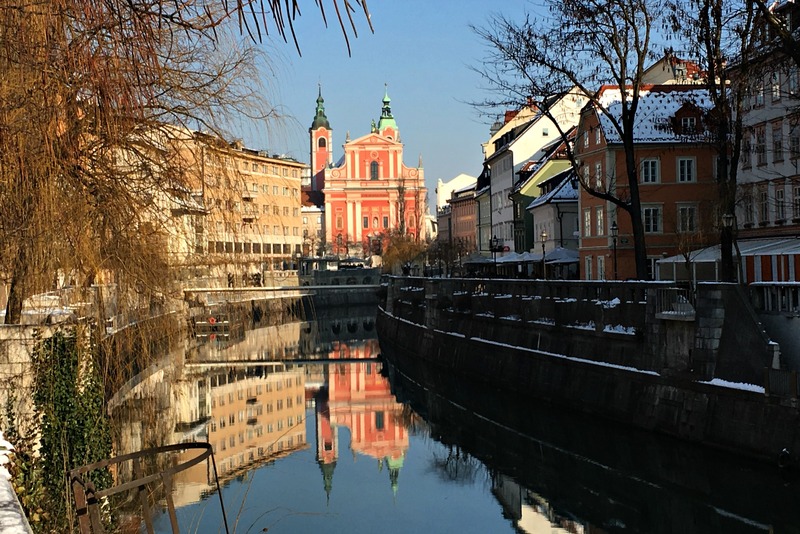 Need to Instagram your moment in Ljubljana RIGHT NOW, but don’t have your new sim card, yet? To prevent you from being cut off from the virtual world while wandering around Ljubljana, the city offers you access to its free Wi-Fi network. Or you can look up what to see in Ljubljana! What other free things to do in Ljubljana would you suggest or add to you Ljubljana Slovenia things to do list? Firstly, I love that Ljubljana does the free city tour thing. I’ve been seeing this come up in more and more cities. Passionate people who want to share their home and then earn what visitors feel their time/skill was worth. I love it. And I would love to do a dragon scavenger hunt with the kids!! Such a beautiful and interesting place to explore! We’ve been taking advantage of these free city tours all over. I wasn’t sure if this was a newer thing, or just something we figured out. In some places, like Munich, there are competing free tours! The free tours sound awesome! I’m sure more people take advantage because of that. I grew up in Poland but have never been to Slovenia. Looks like a fun destination! Slovenia is amazing! I’d like to get to Poland, too. I’ve heard such good things about it. I love city tours, When we go to France in April we are scheduled for several city wallking tours along the route. Looking forward to it. After seeing all your pictures I hope in the next few years to be able to go to some of the spots you have visited. You will love it. I am very excited for your trip! So good as usual! Thanks so much for all the sharing! Amazing that you got to spend a month in Ljubljana. Slovenia is definitely on my list of must see places. I also like to take advantage of free city tours and museum entrances (on certain days) whenever I visit a new city. I will have to keep in mind that these are free in Ljubljana when I finally get to visit. It’s so nice to find some free things when you are traveling as it can be so expensive otherwise. Slovenia looks beautiful! It’s always been a place that I’ve wanted to visit and during winter looks so pretty with the snow. City tours are also one of my favorite things to do! It is really gorgeous in winter. We are starting to seek out city tours wherever we go. That looks like a very interesting city. I have to say though that I read “pee for free” and saw the photo above it, I thought you’ll have to pee by the river. Lol. I love people watching and it’s most certainly my favorite thing to do when I’m in a foreign city. Good to know that they have heaters under the table and blankets too, I can never find an outdoor heater here in London. Also, how much is a reasonable amount for a tip to the guide who gave a free tour? Many of the bathrooms are under the bridges, but they are actual restrooms, not just the river ;). 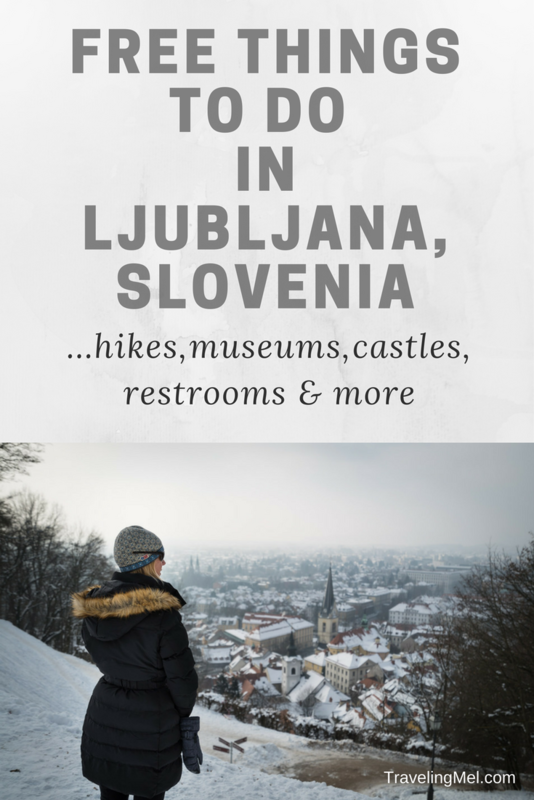 This is such a great resource for when I get to Ljubljana! I really wanna look for dragons! and I love that you included peeing for free in your post. Paying to use the restroom is always a point of shock for first-time visitors to Europe. Good to know the bathrooms are kept up as well! There are dragons everywhere once you start looking around. It’s pretty fun! All the winter shots look so majestic. I love the Dragon Bridge story, which I agree does sound a little off since they did slay the Dragon. And peeing for free is a plus in an European city! Thanks for that tip. It would be nice to go on a free tour of the city and get thee local perspective. It’s amazing how happy a free bathroom makes me! This makes me wish I had visited Slovenia when I was traveling in Eastern Europe! I want to see the Ljubljana Castle and Metelkova Mesto especially. Thanks for the guide, I’m bookmarking for when I make it over there! Hope you do make it there. It’s well worth the effort! I have visited Slovenia but never made it to Ljubljana. It does look like such a beautiful city, though I am not sure I would want to visit in winter, though it does like nice with the snow!! I love free walking tours and I would certainly do that if I visit. I think most people visit in summer. I am sure it is lovely, if more crowded. I loved Slovenia when I went, but didn’t get much time in Ljubljana to explore. I would be really into the city tours! They take you to so many incredible places and give you inside info on the city as true locals. The castle is stunning. I love European Castles they are just so magical. The city tours are so great because they really help you see the city differently and appreciate it more. I’ve heard such good things about Ljubljana, and your pictures make it look so magical in Winter! I love taking free city tours in every place I visit, so this recommendation is super helpful, but I think my favourite thing has t be the castle – how magestic! It’s such a charming city. We loved it and can’t wait to go back. I think that many people don’t realise that you can do fun stuff whilst on a trip for free. I love visiting castles and loved the image that you took. I also love dragon’s and Greek Mythology and I had never heard of that part of the story in Jason so thank you for teaching me something new. The Metekovla art looks crazy. Isn’t it great that there are so many freebies out there? You just have to walk around and find them! I’m actually going to Ljubljana next week for 2 days to finish up my 2 week trip through Croatia. I imagine by then my funds will be rather depleted so this list is so useful! Free/almost free things are always the best. Thanks so much for sharing – very excited to pee for free! You are going to love it! Ljubljana is such a charming, lovely town. Great post on somewhere I’ve wanted to visit for a long time. Love the street art and it’s good to know you don’t have to put your hand in your pocket every five minutes! Isn’t it nice that there are so many free ways to enjoy the city? We like to search out the free things wherever we go. It means we can travel more and stay longer! Even though Slovenia was less expensive than most of Europe, it was pricier than we expected. Castles, swings hikes and museums are a few of my favorite things so your list hits spot-on for me! I’ve never traveled to Slovenia but I’ll definitely be pinning this list of free things to do for when I go! Put Slovenia on your list! There is so much to see and do.